Ambassador (Ret.) 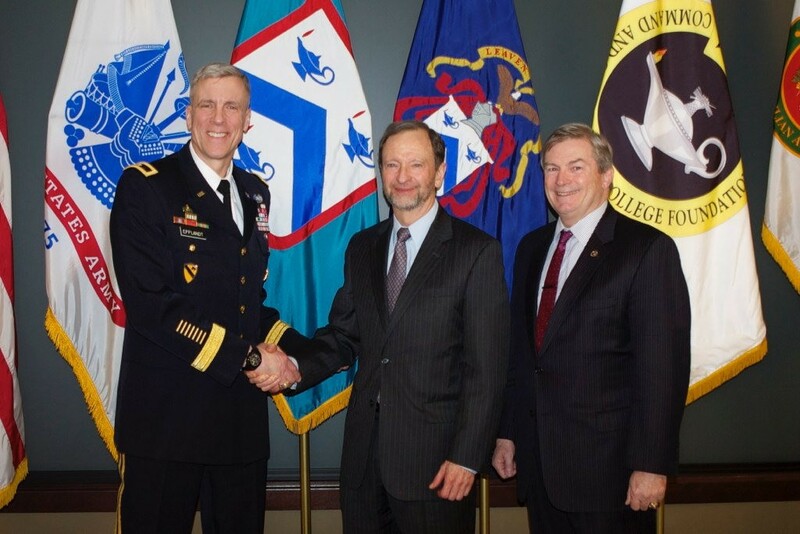 Patrick Moon (center) smiles with Brigadier General Scott Efflandt, Deputy Commandant of the U.S. Army Command and General Staff College (left) and Michael Hockley, Chair of the CGSC Foundation Board of Trustees (right) at the National Security Roundtable on April 4, 2018. Retired Ambassador Patrick S. Moon returned to the Fort Leavenworth area in early April of this year, where he again took part in the Simons Center’s Distinguished Speakers Series. Ambassador Moon, who served as the the U.S. Ambassador to Bosnia and Herzegovina from 2010 to 2013, visited Fort Leavenworth April 2-5. He previously participated in the Distinguished Speakers Series in April 2017. On April 2, Ambassador Moon kicked off his visit with an interview by KMBZ reporter Bill Grady, where he discussed multiple issues relating to U.S. national security, Russian security threats, the State Department, and diplomacy. Short segments of the interview aired throughout Tuesday and Wednesday at the top and bottom of the hour following the news. Ambassador (Ret.) 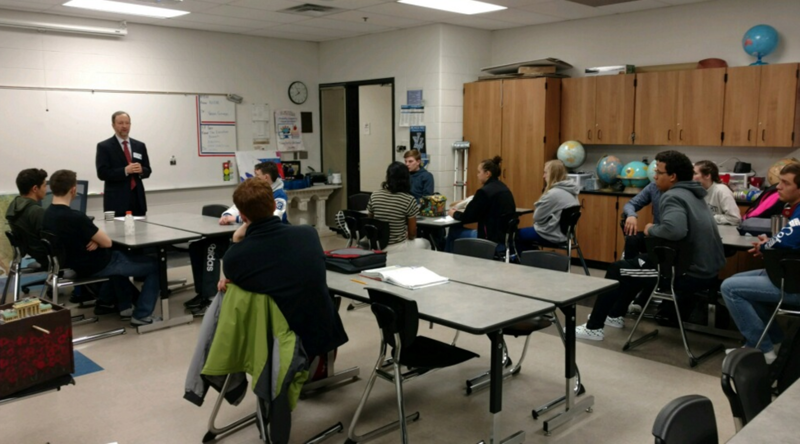 Patrick S. Moon speaks to students in the Advanced Placement American Government courses at Leavenworth High School on April 3, 2018. The following morning, Moon met with students in the Advanced Placement American Government courses at Leavenworth High School, where he talked with the students about diplomacy and national security before answering questions about the Foreign Service, State Department, and the United States Air Force Academy. Also on April 3, Moon joined retired Ambassador David Lambertson to share their experiences on Embassy Country Teams as part of the Simons Center’s InterAgency Brown-Bag Lecture Series. The two former ambassadors, with some 50 attendees present, discussed Ambassadorial expectations and Country Team operations in a foreign country, explaining how embassies are run, how the Ambassador oversees operations in their country, and how interagency cooperation is affected, as well as reviewing the State Department and various national security issues. On the evening of April 4, Ambassador Moon presented the scene-setter kick-off speech at the opening of the spring National Security Roundtable (NSRT). In his remarks, Moon focused on Russia, and how the U.S. might anticipate and address future security threats, particularly in the domains of cyber and space. Ambassador Moon continued his participation in the NSRT the following day, attending panel presentations and joining in on some of the discussions. Ambassador (Ret.) 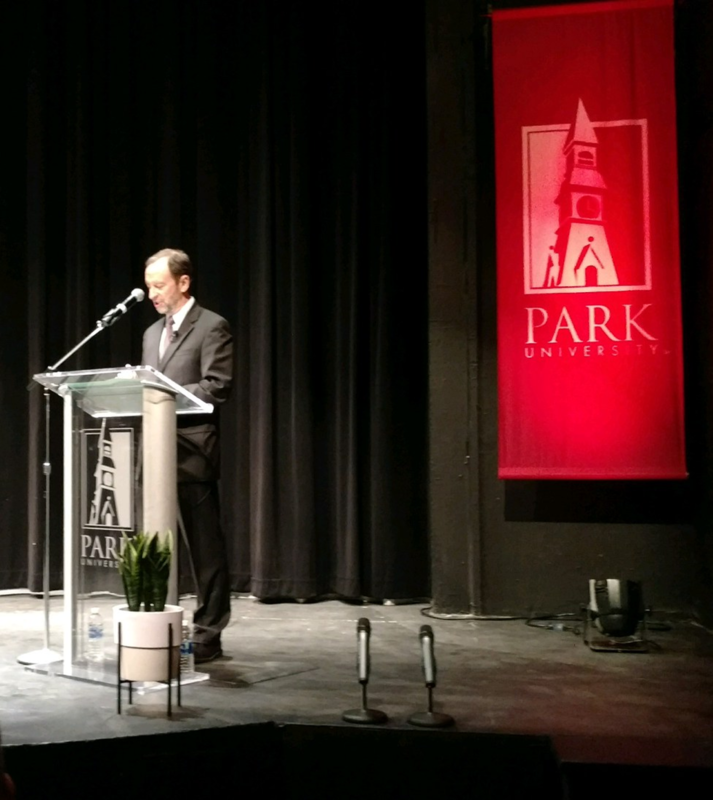 Moon speaks on NATO-Russian relations at Park University on April 4, 2018. Later that evening, Moon spoke on the topic of “NATO-Russian Relations: From the Cold War to Current Challenges” at the David Theater inside Alumni Hall on the Parkville campus as part of a Park University, the International Relations Council (IRC) of Kansas City, and the CGSC Foundation co-sponsored event. The audience included the President and Provost of Park University, Park University Trustees, and Park University faculty and students, as well as several UMKC students. 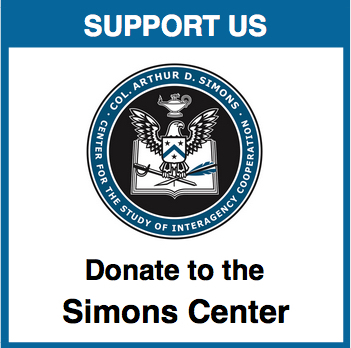 The CGSC Foundation’s Simons Center for Interagency Cooperation “Distinguished Speaker Series” is an extracurricular, educational lecture series that is intended to help enrich the CGSS curriculum. Topics covered in the lectures span the gamut of leadership and ethics, organizational effectiveness, collaboration, as well as current events and issues in business, government and the military. 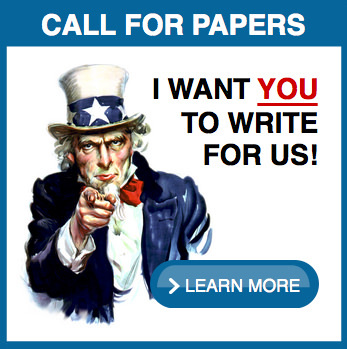 The presentations are scheduled as the availability of selected speakers permits. The CGSC Foundation and the Simons Center have received support for all distinguished speakers in academic year 2018 from Park University along with previous contributions from the Perot Foundation. Ambassador Patrick S. Moon entered the Foreign Service in 1979. He served as the U.S. Ambassador to Bosnia and Herzegovina from 2010 to 2013. From 2013 to 2015 he served as the Civilian Deputy to the Commander of U.S. European Command where he was the senior civilian in the command and he established an interagency program for U.S. 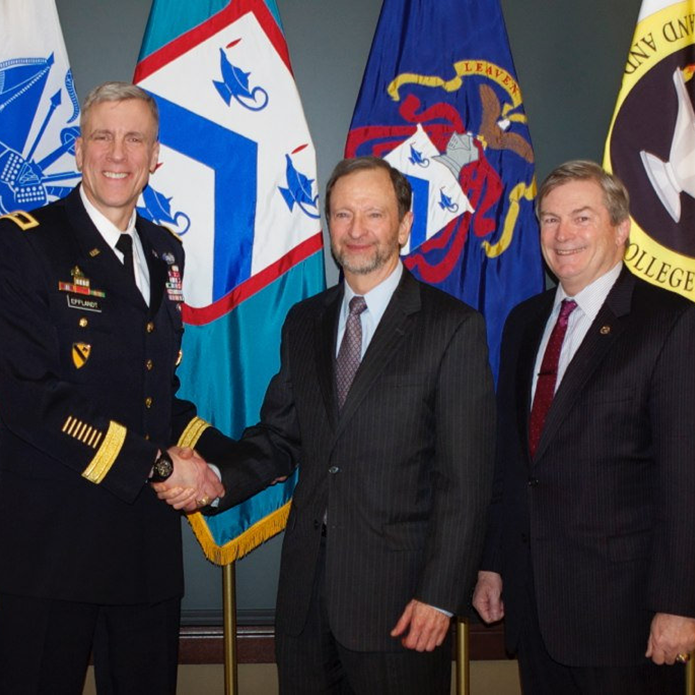 Ambassadors in Europe to meet with senior U.S. military leaders at EUCOM headquarters. His other overseas assignments include duty at Zagreb, Beirut, Lubumbashi (DROC), and at NATO headquarters. His assignments at the State Department include service as the Deputy Assistant Secretary of State for Afghanistan, the Principal Deputy Assistant Secretary of State for South and Central Asia, the Deputy Office Director of the Office for UN Political Affairs, and the Executive Secretary for the U.S. Delegation for the Strategic Nuclear Forces Treaty (START). Ambassador Moon earned his bachelor’s from the United States Air Force Academy and his master’s from the Fletcher School of Law and Diplomacy at Tufts University.